Japan's current economically sustained tourist empire took 20 seemingly long years to rise into economic power. What may have contributed towards its slow economic progress was the frightful stories of expensive Japanese foods including the horrifyingly priced tales of $200 melons. Now with Japan's exchange rate with foreign countries, including the United States, softening; for example, with USDJPY rate going from the all time high of 306.84 in December of 1975; to the lowest of 75.74 in October of 2011. During the all time lowest, in my understanding, 1 dollar was worth 75.74 yen which makes it much cheaper to exchange USD to JPY than it was in the last few decades. This makes traveling from America to Japan using US currency much cheaper than it was. Japan is a travelers hot-spot. In 2016, Japan even reached the tourists goal of 20 million visitors according to Marco Advisors’ website. Japan's government set a new goal of 40 million visitors by 2020's Olympic games which Japan is privileged in taking the responsibility of hosting. The advancement in Japan's economy and its portrayal today motivates many tourists now to visit Japan. With great number of tourists, comes greater responsibility. And not all tourists are in accordance or knowledgeable of Kyoto's etiquette. Therefore, it's perhaps difficult for some tourists to be in accordance with Japan's mannerism with tourists being in an environment different from their own; not accustomed with the different etiquette which may be complex according to each country in their own way. For all people to corporate with the manners of Kyoto, the Kyoto Government issued a guide on etiquette how-tos according to CNN's article author, Maggie Hiufu Wong. This article how-tos is called Akemahen of Kyoto, which is translated as the "Do-Nots of Kyoto" which was published last year in June. The Akimahen of Kyoto lists easy to understand steps on how to use public bathrooms without dirtying the premises. 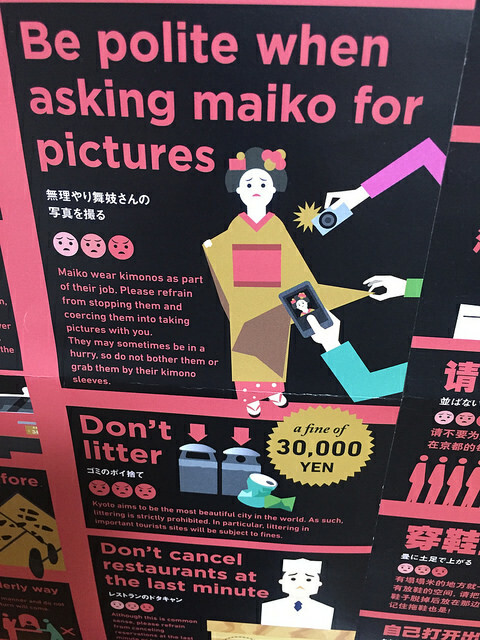 The people of Kyoto are having difficulty getting through to the people of the tourism spots there; therefore, they created the "Do-Nots of Kyoto", a colorful cartoon style list of etiquette informing a list of not-to-dos. Some of the list from the guide are that it informs the audience that one can be fined 1,000 yen by smoking outside, one can be fined 30,000 yen for littering, one should take off your shoes when stepping foot onto the tatami mat (a Japanese style mat that is traditionally made from rice straws), one should wait in line and to not cut in front of others, one should not take pictures near a train, one should also be polite when asking for a photograph of Japanese locals and many other how-tos shown on the colorful information sheet. In Japan, tipping may be generally unacceptable depending on the person and situation. Also, opening taxi doors as a taxi cab customer is not necessary because the taxi doors open automatically unless it is the passengers seat you wish to go into; in which case the taxi personnel will open the door for you. Bicycle riding while being intoxicated puts one at a mighty deterrent/penalty of million yen (roughly 10,000 dollars) or one would have to spend 5 years in prison. Respectively, California law treats drunk bicycle riders as drunk automotive drivers when caught with the total fine of around $3,600; 6 months of prison with many other penalties that are accompanied with the prior ones. The guides on manners of Kyoto city's website are placed out onto public streets, areas and restrooms of Kyoto as stickers etc. in hopes to restore the traditional image of Kyoto Tourism. Following the etiquette as the City of Kyoto informatively gives out will not only preserve Kyoto's style of sparkling environment; but could also have a positive effect to a lawful person in which the law abiding tourist or person can avoid penalties they did not intend to accrue.